Gear sets serve to transfer rotational motion and torque at a known ratio from one driveline axis to another. Simscape™ Driveline™ contains angular gears for transferring rotational motion and torque and linear gears, for transferring translational motion and force. Determine how heat generation affects the efficiency and temperature of driveline components using thermal variants of gear blocks. Use gears to couple inertias that are spinning at the same or at different velocities. Model a transmission that has a variable gear ratio. Model a simple planetary gear and a planetary gear with a locked carrier. Model a coupled planetary gear train. Model frictional losses in gear couplings. Model power loss due to nonideal gear meshing. Learn about the rules for coupling gears. Evaluate the effects of thermal losses on device temperature and performance. Illustrates how you can build your own custom planetary gear components from the Simscape™ Driveline™ Planetary Subcomponents library. The example is based on Example 10.7 published in K.J. Waldron, G.L. Kinzel "Kinematics, Dynamics, and Design of Machinery", 1999. It consists of a coupled planetary train built from simple and compound planetary trains with a common carrier and bevel gears. The simple train fundamental train ratio is -N_4/N_2 * N_7/N_4 = -N_7/N_2. It connects shafts S2 and S7. The compound planetary train fundamental ratio is -N_4/N_2 * N_6/N_5 and it connects shafts S2 and S6. When the input shaft of the train is rotated at 100 rpm, the model shows the output shaft rotates at 1.4456 rpm as given in the reference. 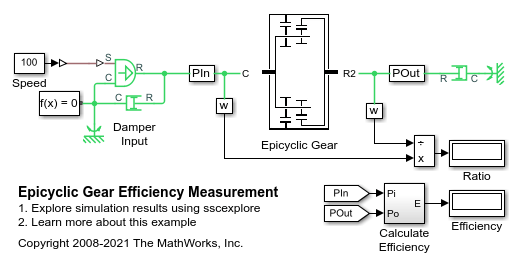 An epicyclic gear drive with overall ratio of 256:1 and verifies its transmission efficiency given the individual gear meshing efficiencies. The example is based on Tuplin, W.A. "Designing Compound Epicyclic Gear Trains for Maximum Speed at High Velocity Ratios", Machine Design, April 4, 1957. The drive is built of two ring-planet elements as shown in the gearbox schematic. The example confirms the transmission efficiency value of 0.22 as predicted by the analytical analysis presented in the paper. 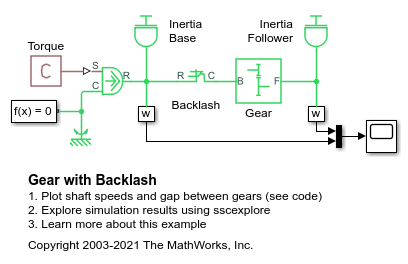 Model a gear with backlash using the Simple Gear in series with the Foundation Library Rotational Hard Stop. The backlash is set to 0.2 degrees, and the damping adjusted so that there are a few oscillations when the torque is applied. 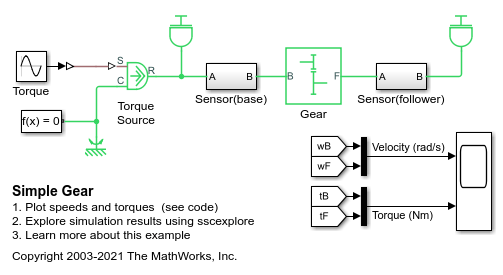 A test for measuring gear box efficiency. The input shaft is driven at a fixed speed and a variable torque is applied to the output shaft. Power is measured on both the input and output shafts, and efficiency is calculated as the ratio of output to input power. 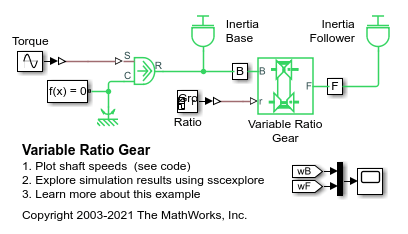 The simulation results match the parameters specified for the efficiency of the gear. A simple gear coupling two inertias (shafts). The gear ratio between the follower (F) and base (B) is 2:1. Thus the angular velocity of the follower shaft is half the angular velocity of the base shaft. The follower shaft torque is twice the base shaft torque. A variable ratio gear coupling two inertias (shafts). The gear ratio between the follower (F) and the base (B) is steadily increased from 1:1 to 2:1. The ratio of the follower to base angular speed decreases with gear ratio, and conversely the ratio of the follower to base torque increases with gear ratio. The variable gear is implemented using the Variable Ratio Transmission block which includes compliance. Appropriate stiffness and damping values for the compliance will depend upon the levels of torque transmitted by the variable gear. If the compliance damping is unrealistically low, the system can develop high frequency oscillations that require small simulation time steps.